The 30 metre classically styled sailing yacht Foftein, listed for sale by Manfred Haas at Haas International, has been sold with Georges Bourgoignie at Fraser introducing the buyer. This striking cutter rigged yacht was built in aluminium by Holland's Royal Huisman yard to a design by German Frers and launched in 1999. 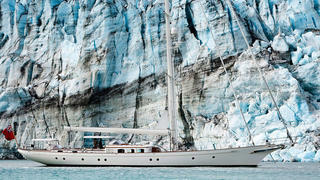 Her only owner since launch is an experienced yachtsman and wanted a very comfortable yacht to cruise the world. A Pieter Beeldsnijder-designed interior in cherry wood panelling combines classic elegance, warmth and practicality, while providing extremely spacious accommodation for six guests in a master suite and two twin guest cabins, all with en-suite facilities. In addition, she has quarters for four crew in two cabins. She features two cockpits — the centre cockpit is the social focus and leads into the deck house, which offers great visibility around the yacht. A second cockpit aft is dedicated to the owner and leads into the master suite. While her appearance may be traditional, her sparkling performance results from a fast hull, a large, tapered aluminium mast and spars, and computer-cut sails with semi-automated handling gear. She was offered for sale with new paint, sails, decks, batteries and standing rigging while, under power, a 354hp Gardner diesel engine gives her a cruising speed of 10 knots. Foftein was asking €5.2 million.